I know, it's Tuesday and I normally have a recipe to share on Tuesdays, but as I mentioned yesterday, I haven't been cooking too much the past couple of weeks. Instead, I've been working on getting rid of some clutter from around the house. You may remember that I challenged myself to remove 500 items from my home this past Spring. While I failed to follow up on the blog for the final 2 weeks of my challenge, I was successful in the challenge itself! At the end of the month, I managed to sell, donate or throw away more than 500 items! That's what really matters, right? I wish I could say that after those 500 items were gone from the house, that this place was spotless and immaculate (with the occasional goldfish cracker between the sofa cushions and fruit snack on the floor) but sadly, it's still looking like the makings of a Hoarder's episode in my basement. With Grace now being the perfect age for arts and crafts, I need to toddler proof our basement so we can crack out the finger paints, markers, glitter...all of that messy stuff I don't want in my living room or kitchen! Currently, we do that stuff outside, but when the weather turns cold we'll need to do that stuff inside. In addition to an arts and crafts station for Grace, I need to clear out some space for me to "work". When we first moved into this house, Joe set up a wonderful craft area for me downstairs. And, for about a year, I really enjoyed working in that space. When I was pregnant with Grace, I had really bad morning sickness that prevented me from venturing too far from the bathroom. By the time the morning sickness was over, there were other issues that prevented me from spending much time on my feet. Fast forward to now, my craft area is filled with stuff I just don't know what to do with. Stuff that should be packed away in the attic, sold on ebay, or just needs to be thrown away. That is my goal now. By the end of August, I'd like to have another 500+ items removed from the house! I'll keep y'all posted on my progress each week...on Tuesdays. My goal is 100 items per week. If y'all want to join in, I can set up a linky and we can all share photos of our 100 items before they leave the house! Let me know! 500 is a big goal! Go for it and good luck! 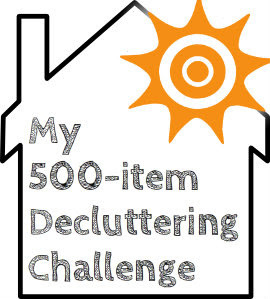 Not sure I could hit 500 items (willingly) but I'd love to join in a declutter challenge! Hello Alison, I stumbled across your blog when I googled declutter..did you manage to reach this goal? I need to do this and think its a fab idea.